A lot of E&EL’s women readers have asked me to take the plunge into womenswear. A delicate task that. And last month, just as I was contemplating a starting point, along came an offer. True confession: I do try and read these books as they come out. 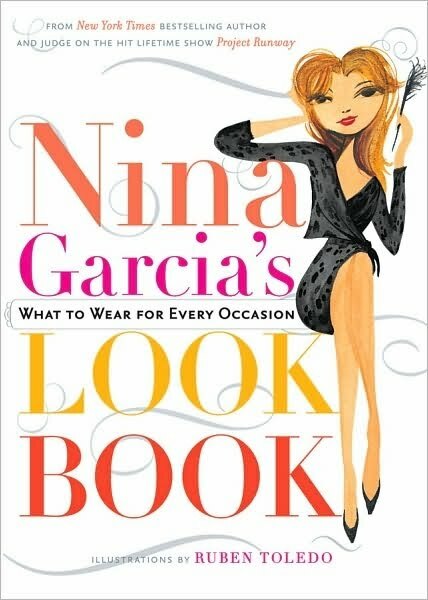 The nice people at Voice contacted me and asked if I would like to have a review copy of Nina Garcia’s Look Book: What to Wear for Every Occasion. I hesitated to accept. Not that I haven’t purchased The Little Black Book of Style and The One Hundred for Mrs. E. (they remain unread), but because woman’s clothing — women’s fashion — is so mercurial that I have a hard time believing that anyone can offer timeless advice on the subject let alone illustrate it with examples. To some extent, I’m right. I’m sure that one day the wonderful illustrations by Ruben Toledo will look dated, as quaint as the advertisements from the 40’s, 50’s and 60’s. The thing about those looks is that they continue to inspire today’s designers. Which is how we should begin to approach What to Wear — as inspiration. Ms. Garcia‘s style icons will be familiar to readers of Easy and Elegant Life, both Hepburns get mentioned a lot and of course they should! Really, the book attempts to answer those questions which the Project Runway judge and fashion director of Marie Claire gets asked the most. Surprise! Plus ça change. “What should I wear to .. ?” is how each of those questions begin. Ms. Garcia takes an interesting tack with each situation that the reader is likely to encounter. She invariably asks you to ask yourself: “Is this too … ?” Which means that the book is riddled with advice to trust yourself and to wear your clothes with confidence. Unless your choice involves wearing jeans to an interview. Amen. For those who are still a little shaky on their fashionable stilettos, Ms. Garcia gives very good general advice based on sound ideas like colour and proportion in search of the perfect blend of classic and modern. Until you get to the bachelorette party, the chapter on which begins with a quote by Flaubert that “Exuberance is better than taste.” And any book that addresses “Hangover Chic” can’t be all bad. Indeed, this book will take you from job interview to meeting the parents, holidays to Holy Days, first dates to first marriages and breakfast to the club. The Look Book is easy to read, breezy and realistic enough for those unsure of their style footing. Which can be all of us at one time or another. Just take a look at the quotes sprinkled throughout, Epictetus to Anthony Bourdain have contemplated how we present ourselves. If I had to boil the book down to a soundbite, I think that Ms. Garcia shares the Easy and Elegant Life viewpoint: Life is an occasion, dress well for it and have a little fun along the way. Fashion week starts tomorrow. I wonder what Ms. Garcia will think of the collections and how they relate to her philosophy? This entry was posted in Elegantology, In the News and tagged "The Look Book: What to Wear for Every Occasion", Anthony Bourdain, Easy and Elegant Life, Elegantology, Epictetus, Fashion Week, In the News, Marie Claire, Nina Garcia, Project Runway, Ruben Toledo, What to wear to an afternoon wedding. Bookmark the permalink. Please. It’s not like there aren’t already a gazillion blogs about womenswear. Do you really want to be all things to all people? Best wishes, and good-bye.